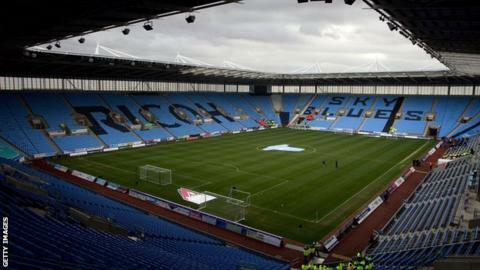 New Coventry City managing director Chris Anderson says they have located a site to build a potential new home in the city and end the Sky Blues' current tenancy arrangement at the Ricoh Arena. But he has also arranged to sit down and talk to City's landlords Wasps about the football club's existing contract, which expires in August 2016. "There's ongoing work on a stadium, as an alternative to the Ricoh," he said. "We've made very good progress in the last few weeks on tying things down." "The mistake that's been made in the past is to make people think that it's imminent," he told BBC Coventry & Warwickshire. "That heightened expectations to such a point that was unrealistic. We will not make the mistake of announcing things that are not ready to be announced." Speaking at his official unveiling at the club's Ryton training ground, German-born author and former American University professor Anderson added: "Can I reassure the supporters of what's going to happen? No, I don't know. I just got into the job. But I can tell you what I intend to do. "What I intend to do is for this football club to play games in Coventry, for this football club to have a stable home. "For the club to be able to do that, it needs to be able to benefit from its own success. We need to have a home we can use in a way to help the club. We need to be able to participate in our own success. "If Wasps come to me and say 'Stay here for 10 years rent free, give us all the receipts', I'm totally open to that. It's unlikely they'll do that. I'm joking. But there are a lot of shared interests. There are operational issues to be discussed. We'll have a nice social call on Thursday where I'll get to know some of the people and talk about the situation. "Of course I'm not ruling it out, that would be silly. I look forward to getting to know them. They are our partners in this. We're playing in a venue owned by them and I want to have a really good relationship with them." Since leaving Highfield Road in 2005, the Sky Blues have not owned their own ground, having only been the tenants at their 32,000-capacity home. They initially paid rent to Arena Coventry Ltd, who managed the stadium on behalf of the owners, Coventry City Council and the Alan Edward Higgs Charity. A long-drawn-out argument over how much rent they should pay turned messy when the Sky Blues upped sticks to move to Sixfields, home of Northampton Town, more than 30 miles away. After staying there for 14 months, they returned to Coventry in September 2014 - just weeks before it became clear that Premiership rugby side Wasps were to move to the city to play at the Ricoh. When Wasps then became owners of the stadium in November 2014, City became the rugby club's tenants.